do styling pieces count as "furniture"
also where is the front door??? Really cool contest! These remix contest have hype and challenges like no other! Looking forward to what creations pop-up from this one! @renakate, if you mean accessories (phones, books, pencils, etc.) when you talk about styling pieces, I'm pretty sure that you are allowed. I mean, it seems a little outlandish for no accessories to be permitted, but just to be sure, it is good to ask Roomstyler. Why? Who will to move here, there's nothing for them? I mean, some small furniture or whatever.. After all, it has to sleep somewhere.. too..!? @renakate it's a room in an appartement. The door opens to a corridor with a front door, but not relevant here. Do we need to include stuff like a bed and kitchen? The competition rules were not respected by many..
Can we add some extra furniture? I've removed quite some entries in this contest that were flagged. If anyone wonders why: the contest is about low-budget decorating of a rented apartment. Nothing structural should be changed: Not extra walls, beams on the ceiling, not elevated floors, no extra doors or windows. Use the 6 objects and some extra, keep it simple and most of all cheap. The challenge is in making a homy place with minimal effort! oh I see, we are not to add a door, even though there are none at all? Nico can we add a kitchen? We'll actually no. The kitchen is somewhere else in the flat. Besides, would you add a kitchen if you're moving into a rented apartment? Hi! 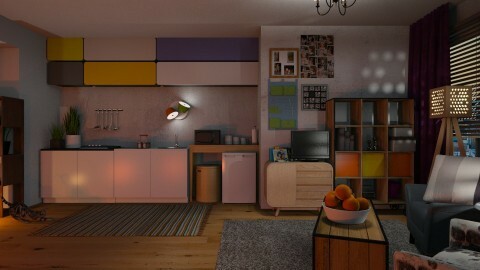 Was my design removed from the contest, cuz I made a kitchen corner there? Well It's a pity, as I haven't seen message about forbiddance of adding kitchen, before now. Nothing structural should be added, that includes a kitchen. It's a rental, and you're low on budget! But just take it out, make some changes and you can sumbit again. ok, thank you for answer! So is this room like the whole apartment? Should we add a bedroom or something? Agree with you marocco! A lot of people kept one item out. Unfair.